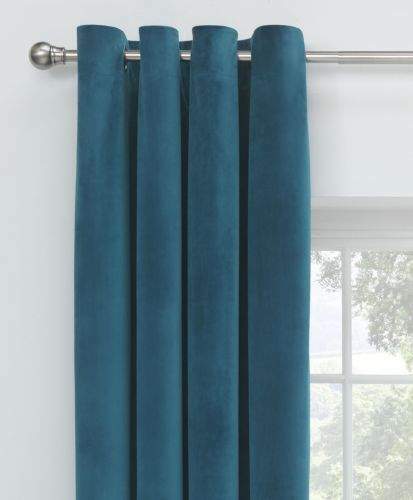 Finish a room off to perfection with these velvet lined ready-made curtains from The Collection by Argos. The lustrous velvet provides a beautiful drape as well as a polished, stylish finish. Made from 100% polyester . Lining fabric: 50% cotton, 50% and polyester. We have these in champagne and there really nice, Got them in my very fussy 20 year old daughter room. Comes up £70 for me what drop down menu do I use for it to be 11.99?? Says it's for Green, 66x90 in the title. I assume that's the only option that goes through at that price. Have a look on argos actual website. 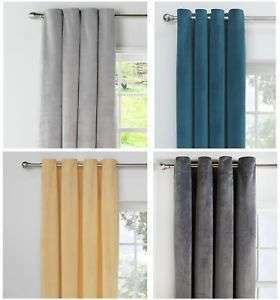 Loads more choice of eyelet curtains heavily reduced if you dig around the sizes. Also the sizes are in modern English. Not the fathoms or whatever it is they are using on the ebay listing. Good spot, OP. They look nice and fit the colour scheme of our living room, so bought! Yay! Says it's for Green, 66x90 in the title. I assume that's the only option …Says it's for Green, 66x90 in the title. I assume that's the only option that goes through at that price. I've just received a set of these and the quality's excellent for the price. I've just received a set of these and the quality's excellent for the …I've just received a set of these and the quality's excellent for the price. It’s a pair supplied. More teal than green in colour. The photos on the website for the colour match. It’s a pair supplied. More teal than green in colour. The photos on the w …It’s a pair supplied. More teal than green in colour. The photos on the website for the colour match. Cool... Thanks mate. Just ordered 2 sets. ordered 2 pairs ...am hoping for TEAL !! I quite like Teal/Green, actually, it'd be the colour I'd go for. The other ones are a bit too neutral for me. Though if I was the OP, I'd crop the picture to show the Green curtains only. But it's pretty clear now which colour this Deal is for. Got mine today - Argos are great for quick deliveries. Nice and cosy and dark for the winter coming - well - it's felt like winter's coming in Glasgow these last few weeks!! Put them up in the living room, will do the bedroom next. Would've preferred another colour for the bedroom but not gonna complain! Edit: My sister just bought a pair as well Thanks again. I received mine today too. I would say they are more of a teal colour, which is perfect as they match the bedroom colour scheme. Colour is described as peacock on the packaging. Got mine today - Argos are great for quick deliveries. Nice and cosy and …Got mine today - Argos are great for quick deliveries. Nice and cosy and dark for the winter coming - well - it's felt like winter's coming in Glasgow these last few weeks!! Put them up in the living room, will do the bedroom next.Would've preferred another colour for the bedroom but not gonna complain!Edit: My sister just bought a pair as well Thanks again. Got my first set yesterday to test how they look. Pretty decent actually. Ordered second d set for patio doors as I didn't wanna buy two sets of the colour wasn't right. Totally happy. Thanks, OP. I have them in my teen boys room they are so soft and thick and block almost all the light. More blue than green. Just gutted the gray ones are £70!